Materion Performance Alloys produces a number of engineered high performance copper alloys using a patented technology called EquaCast® technology. This process produces an extremely uniform, fine-grained microstructure and promotes excellent dispersion of alloy elements for high quality, consistent products. 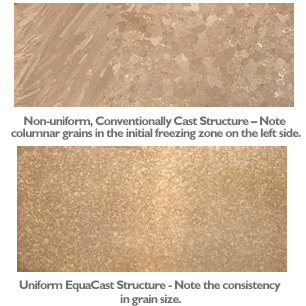 Products cast with the EquaCast structure show mechanical and physical properties similar to their wrought equivalents, without the added expense of hot and cold working. Further refinement by hot or cold working further enhances the properties, resulting in a superior product. Materion engineers are at the forefront of advancements in custom alloy development and engineered solutions for a variety of metallurgical challenges. Contact a Materion alloy engineer today to discuss how Materion can support your alloy design needs.